For a truly magnificent showcase of traditional English garden design here in southern Connecticut, one need not look further than the Old Mill Farm in Greenwich. The landscape is a James Doyle creation and uses an array of horticultural features, including herbaceous borders, rose garden, folly, maze, chess set, parterre, topiaries and water features. 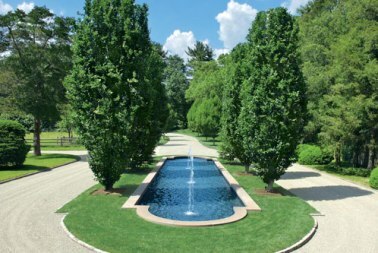 A favorite feature is the flank pool lined with Fastigiata at the entrance of the estate. 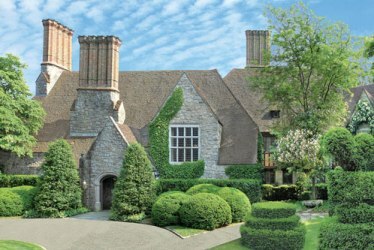 Simple structural plantings serve to accent the private Tudor estate, designed by architect Charles Lewis Bowman in 1926. 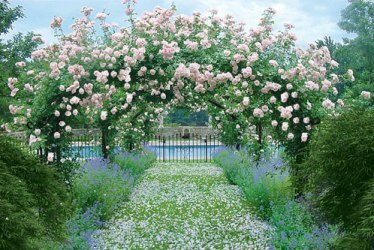 An arbor blanketed with pink “New Dawn” roses makes quite an enchanting pathway. Most people approach their gardens separately from their home’s interior, but thinking of them in conjunction can make for some postcard-worthy views. Think about it: some of your outdoor space can be seen easily from the windows inside, so marrying the interior and exterior will be well worth it. From inside, look out the windows to determine which views you’d hate to hide and which ones could use some sprucing up. If your home has large windows, the view outside becomes a part of the interior’s wall. Don’t be matchy-matchy, but use complementary colors inside for a well-thought-out look. Bring some of the outdoors in with potted plants to unify the two spaces. If you want to see even more of the outdoors from your home than you can now, think about adding a sunroom. Visit Marvin Gardens for all the garden accessories you’ll need to create beautiful indoor views with your landscaping.